Thera Antimicrobial Skin Cleanser, Antimicrobial Cleanser, BUY Antibacterial Skin Cleanser, 116-BCLA8OZ, 116-BCLA4OZ. Thera Antimicrobial Cleansers are skin cleansers that protects and nourishes while it cleanses. The light, lavender scented cleanser is antimicrobial, so it eliminates bacteria when applied. To use, simply spray a small amount onto a damp washcloth or directly on the skin and wipe the soiled area. There is no need to rinse away this cleanser. This Antimicrobial Skin Cleanser contains Benzalkonium Chloride, which is an antiseptic designed to kill germs. 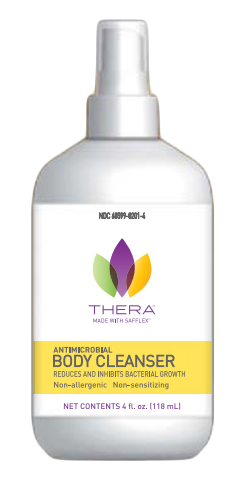 Unlike some other Antibacterial Cleansers, the Thera Cleanser has skin soothing and moisturizing properties. The hyaluronic acid contained in the Thera Antimicrobial Skin Cleanser will help hydrate and improve the skins appearance over time. Improves the kook of skin over time. Sooths and moisturizes while cleaning. 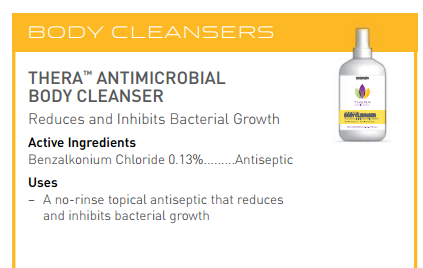 Thera Antimicrobial Body Cleanser Product number: 116-BCLA8OZ, 116-BCLA4OZ. Sizes: 4 oz, 8 oz. Active Ingredient: Benzalkonium Chloride 0.13%. The lavender scent is a welcome change to those medicinal smelling cleansers we used to buy. This is a good skin cleanser for medical uses. Thera Antimicrobial Body Cleanser Works! This stuff works so well. Most cleansers leave the skin feeling chapped, but the thera body cleanser doesn't do that.